Among the rare chance happened during the Ubud Food Festival was the prospect of meeting famous chefs from Bali, and from abroad as well. Take for example Chef Wan from Malaysia. Hosting several cooking shows on TV, Chef Wan's funny and talkative personality is always entertaining to watch, either when he's in the kitchen, outside on the street teaching random westerners to cook healthy Asian dishes, or staging a popularity contest between his Malaysian cooking vs UK cities' local favorite. 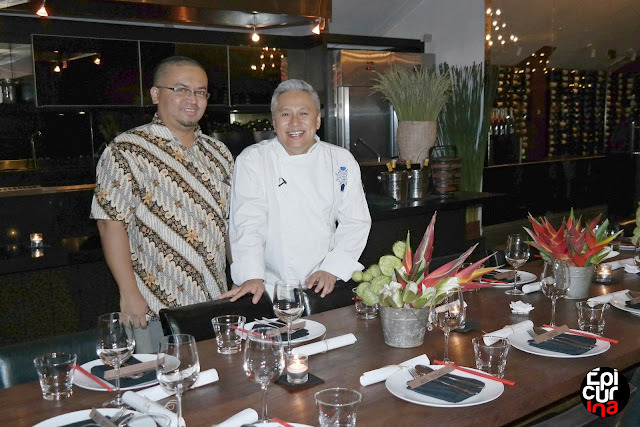 While I was aiming to meet him during his appearance in Ubud Food Festival, an opportunity came up earlier when Will Meyrick invited Epicurina - Bali Food Blog, to join him in welcoming Chef Wan to Mama San! It turned out that the two knows and grows close to each other during Chef Will's opening of his new restaurant in Kuala Lumpur, Malaysia. Surely this is an opportunity that I can't pass. 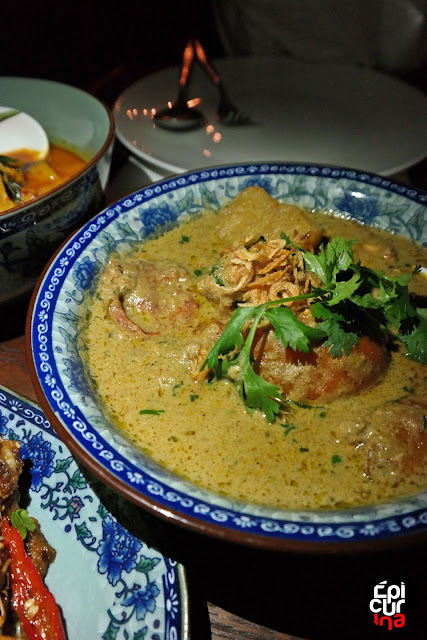 The event itself was a cooking collaboration between Chef Wan and Chef Will, where Chef Wan was cooking Malaysian dishes, and Chef Will cooking Peranakan cuisine. I managed to grab Chef Wan aside for this photo shot, during the meet and greet session before the dinner. 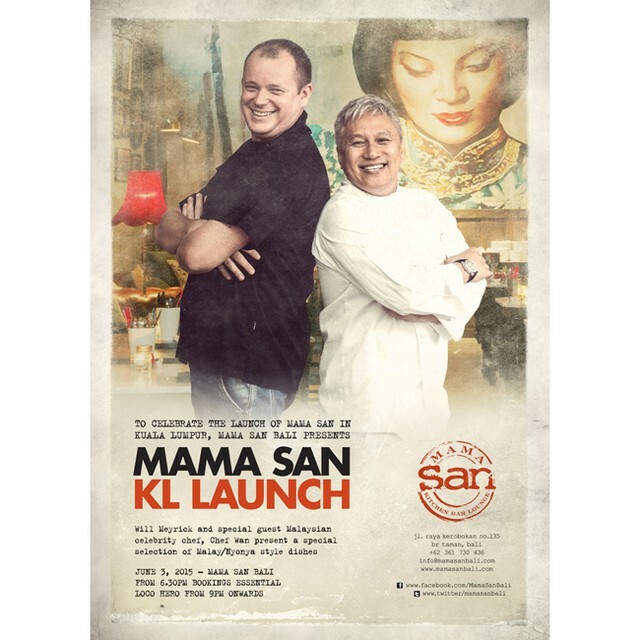 It turned out that what we seen on TV is not much different with the reality: Chef Wan has this vibrant personality, quick wit, and very very talkative. He quickly getting acquainted with the guests, telling jokes and laughing along with the guests as if they've been buddies for years. 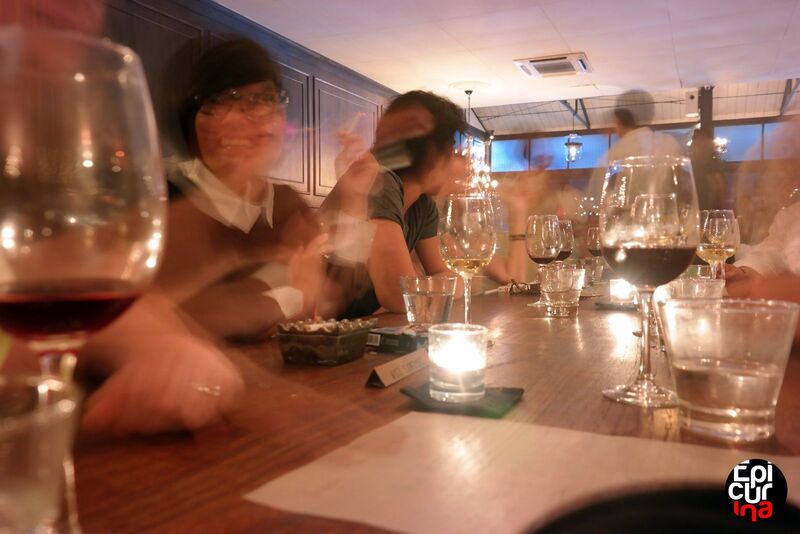 Chef Wan has this amazing skill of starting up a conversation, and making people felt welcomed, all in an effortless manner. It's no wonder that the Malaysian Government appointed him as Food Ambassador to Tourism Malaysia. 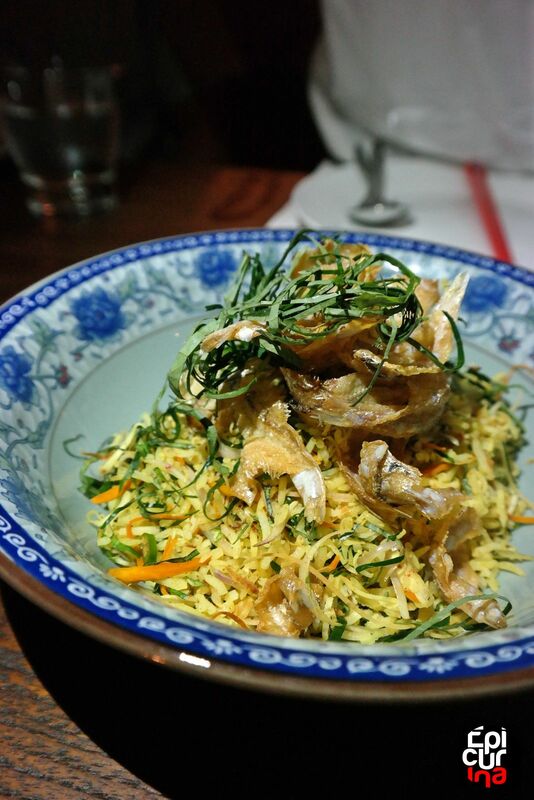 Our journey into the Malaysian and Peranakan Cuisine was started with Soft shell crab with torch ginger flower, char kue peanuts, sesame seed and rujak salad. 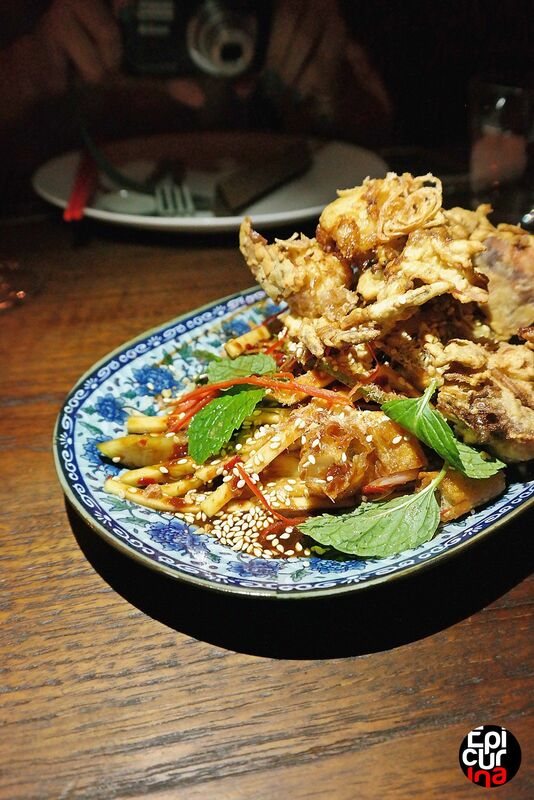 While the batter fried soft shell crab gives out a mellow sea flavor, combined with the spicy rujak salad they compliment each other, and it was a quite eye opening starter. 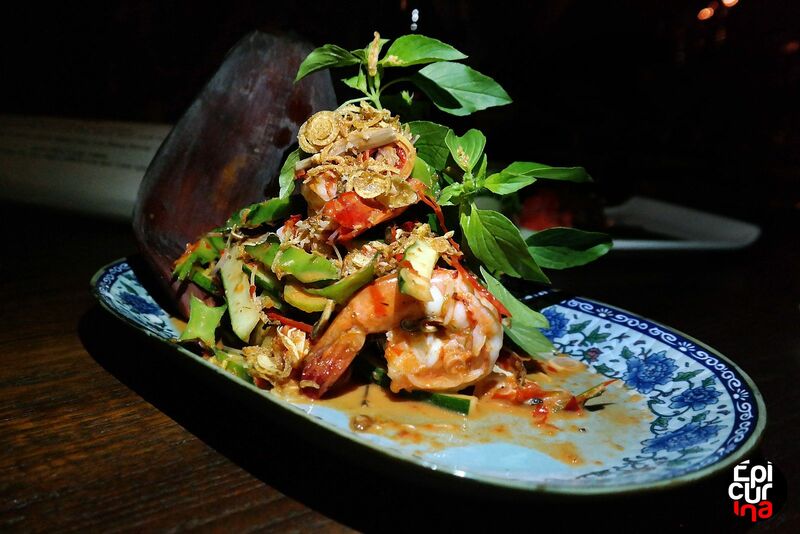 The soft shell crab was then followed up with this woody tangy creamy fragrant dish of Sambal jantung pisang (banana flower), with fresh prawn, torch ginger flower and kalamansi. Coming from a family that familiar with both jantung pisang and torch ginger, I was quite amused why we've never thought the two works well together. Our next dish emanates this rustic Asian flavor, especially with the addition of tauco (fermented bean curd). 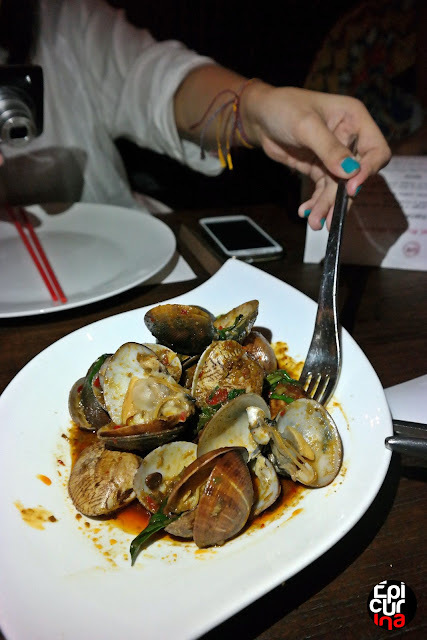 The Nyonya style stir fried clams with chili padi, Thai basil, green shallots and Tauco was quickly becoming the guests' favorite. Next came Nasi Ulam with kencur (lesser galangal), ginger flower, shredded betel leaf, Vietnamese mint, lime leaf and ikan asin (salted dried fish). While Indonesia has their own version of Nasi Ulam from Betawi ethnic, the one presented was resembling Malaysian style and it contains a lot of fragrant ingredients put into it, which in turn create an aromatic dish. 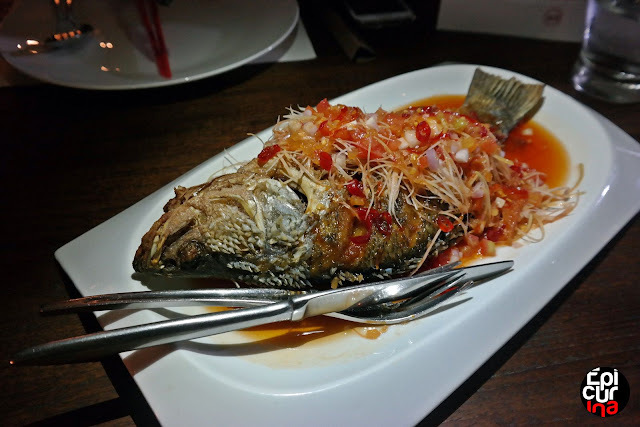 The addition of Ikan Asin enhanced both the texture and the taste of the dish. Peranakan crispy barramundi, with torch ginger flower, chili, shallots and lime leaf represents the Sweet and Sour fish, one of Chef Meyric's creation in Hujan Locale Ubud which we adored. Still using the same barramundi (kakap putih in Indonesian), the difference is that this one was more aromatic and spicier. Baba's Nyonya fish head curry with okra, tomato, tamarind and fish curry powder was among the creamiest dish of the night, even though it was well balanced with the inclusion of tamarind (asam jawa in Indonesian), and tomato. 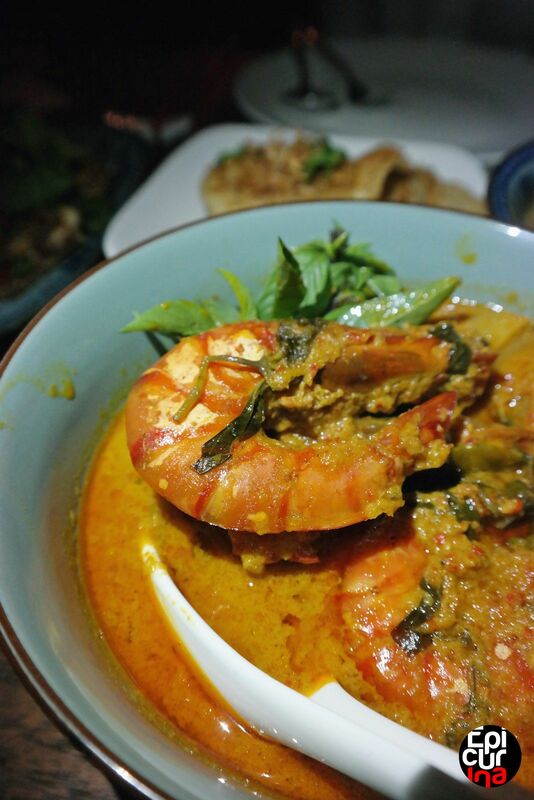 Next came Gulai Udang Nenas, fresh prawn cooked in turmeric, lemon grass, fresh pineapple with coconut milk. While the coconut milk adds creaminess to the dish, the sweet and sour pineapple (Nenas) help lighten and balanced the mouth-feel. It goes really well with the prawns. 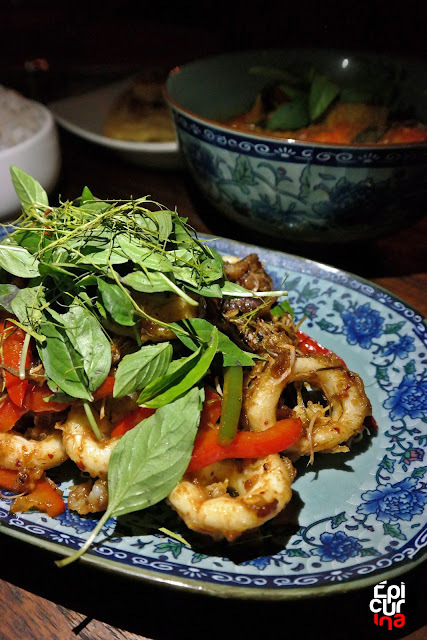 Came as the last main was Fried Fragrant Cumi-Cumi, squids or calamari fried with Tom Yam paste, ginger torch, lemon grass and honey. It was nicely chewy, flavorful, and the addition of honey was just enough to add sweetness into the dish. As the closure to our dining experience was Chef Wan's Jackfruit Custard, which resembles srikaya with extra punch of the jackfruit, and Chef Will's Coconut ice cream which nicely reinforced with peanuts and roasted coconut, made perfect with the addition of young coconut flesh you can scoop right off the bowl's wall, as it was presented in halved coconut. 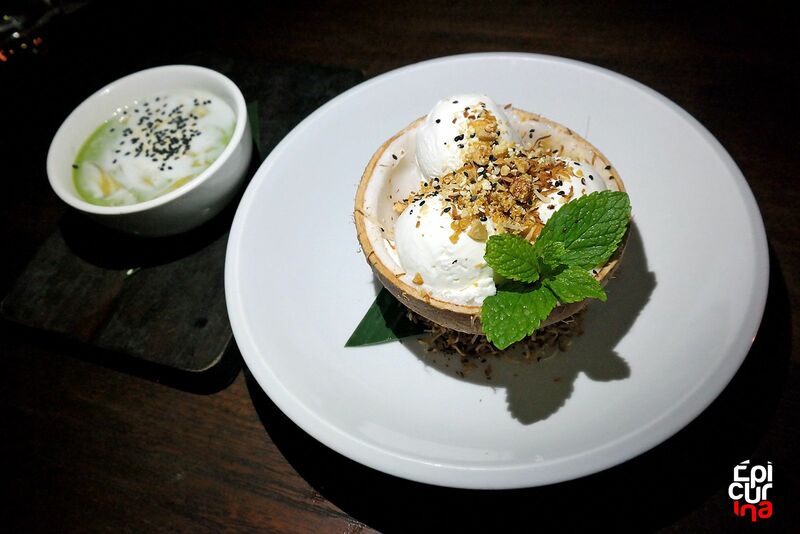 Balance was a bit of an issue as the halved coconut has curvy base, but taste wise it was the best coconut ice cream version we ever had. 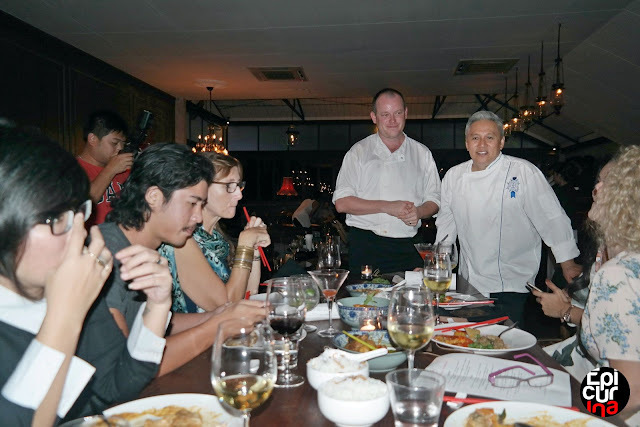 While Chef Will stayed more in the kitchen, focusing on delivering the dinner, Chef Wan would occasionally showed up and entertain the guests with small chats, funny talks, maintaining the cheerful vibe all the way until the dinner was over. Such a tremendous energy.